Well this is one way to use a room screen. There are many others of course. I angled a bed into a corner, and honestly did not plan to use any artwork about the bed. With it angled in the corner it could easily look wonky because the artwork would not be centered above the bed. I like this screen because of the raw unstained, unpainted wood. It gives the screen a rustic feel. The glass adds interest while making it more visually open. More and more I am drawn to pieces like this that are architectural. 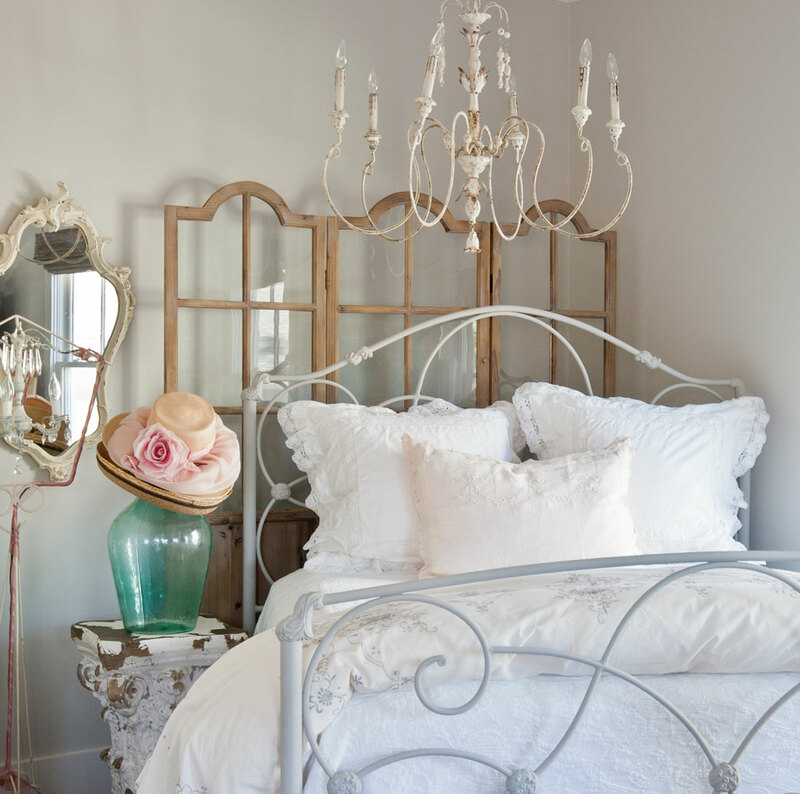 If you want to go more neutral in your home, this type of item is a great thing to add. Here you are texture and visual interest without introducing a lot of color in the room. See how the glass in the screen makes it feel light and delicate, not heavy? The color is added from the large glass jar and the hats. The column nightstand (from Wisteria) also add architectural interest. As a reminder of what this bedroom looked like before, I’m including a before photo. These things were from our old house but they didn’t make the cut into the new house. They got stuck here. But I wasn’t happy with the look of the room. I’m beginning to like this room very much. And isn’t that the point of decorating, to enjoy our homes and love living in them? I am in love with this screen! So delicate and stunning! I love that look! You are right, it is so light and airy looking. I wonder if you would mind telling us where you purchased it? It is such a lovely touch! 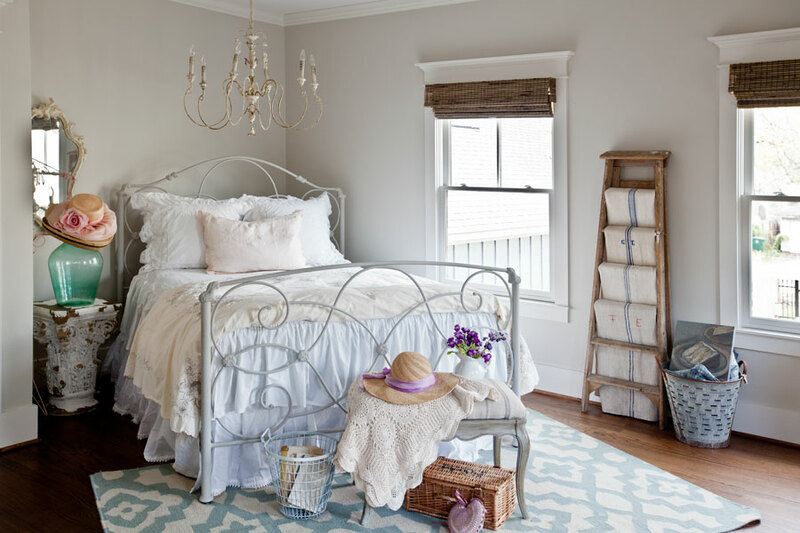 From the beautiful chandelier and bed frame. In my humble opinion! It was already lovely! Sometimes simple is best. You are an amazing blogger and decorator. I am a fan ! Where does one find a screen like that – or similar? I love the idea. I would replace the glass with mirrors. Thanks! I found it at Jubilee in the Houston Heights. I don’t know Daphne! Sometimes I get emails that are not junk in my junk folder. I can’t explain it. 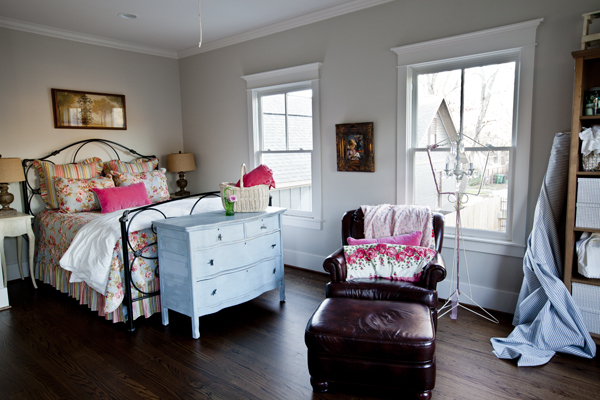 Love love love this room! Beautiful! Love the glass screen positioning and I’m in love with the architectural design as well! I love the room to look at but as a guest I would not find it functional. There’s no lamp for reading in bed, only the chandelier. Then I’m guessing I have to get up and walk to the door where the light switch probably is, then walk back in the dark to the bed. Also no room on nite stand for my glasses, book, or phone. But if it’s just a room to look at it’s very nice. Love the screen. Good points Ann! This room is actually the warehouse for my online shop and it’s my studio where I record my podcast. We really don’t have guests here, so I didn’t feel bad when I moved the lamps and bedside tables out of here. I decided to keep a bed in here just in case. The other bedrooms have bedside tables and lamps. I think the room screen looks really pretty angled behind the bed.